quality care with dedication and respect. Our staff provides comprehensive therapy services in a caring environment to assist residents in returning to a normal lifestyle. 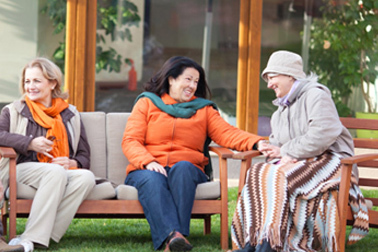 Our compassionate staff provide personal attention and work as a team to support successful rehabilitation. 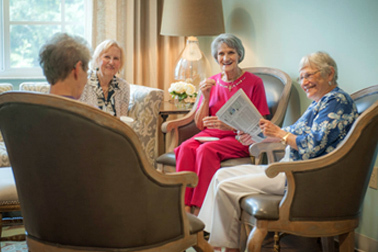 Engaging in activities our residents enjoy will help promote social, emotional, physical, cognitive and spiritual interaction with peers and the community. I came here not knowing if I would live to see tomorrow. Over the 4 years that I was a resident here, it was only through diligent care, on-going restorative therapy, and a passionate and caring staff who would always go the extra mile to care for my needs that I am here today. I’m about to leave after 30 days of rehab. I had a traumatic motorcycle accident with broken hip, ribs and wrist. Life saving emergency surgery at Theda and after 4 days I’m in rehab. No one referred me but it was close to home. All I can say is the whole works at top, team effort in the rehab and CNA’s at your bedside. They treat you like family not a number. Cheerful, talkative and attentive. I could go on and on. I would recommend to my family members . From the first day to the last day, the staff made me feel very important to them. Every effort was made to ensure my comfort. Thanks to the excellent care I am going home and I will be able to walk normally again. The Therapy staff makes exercise fun and welcome all patients like family. I would highly recommend this facility to anyone needing rehabilitation.